At the end of the third day of our Intermediate Coastal Skipper course in Canada’s Gulf Islands, the four of us—three students and one instructor—anchored our Jeanneau 35 charter boat in Clam Bay, a quiet spot between Thetis and Penelakut islands. Snugging down for the night, we put a snubber on the anchor chain, put the sailcover on, scrubbed the deck and loosened the painter on the dinghy so that it could float freely away from the boat. As we’d done every other evening on the course, we reviewed the day and the skills we had covered. The instructor stressed once again that the safety of the crew and boat was the skipper’s responsibility. In the morning we listened to the weather forecast, consulted the charts and plotted our route to Ganges Harbour. Then we checked the engine fluids and battery charge. Soon we were ready to get underway. On deck, two of us went to the anchor to remove the snubber, and a third stayed at the helm. Calling back to the cockpit, we gave the signal to motor up to our anchor so we could raise the chain with minimal strain on the windlass. Suddenly the engine stalled and everything went quiet. The helmsman raised his hands in the air and shrugged his shoulders. My heart sank as I felt the sudden pressure of being tested. What should we do next? At least we were still anchored, but what had we forgotten to do, what had we missed in our earlier checks? The instructor looked at us for answers, and we couldn’t give him one. We fed out more anchor chain to put us at our original scope and went back to the cockpit to troubleshoot the engine problem. Everything looked to be in order, so we tried to start the engine again. 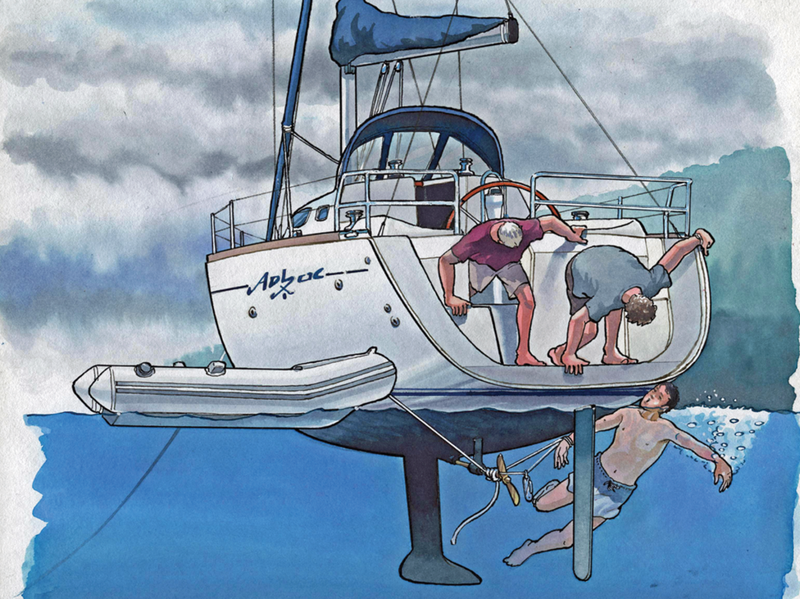 It fired up easily, and once again, two of us went to the foredeck to raise anchor and signaled for the helmsman to go forward—and once again the motor sputtered and stalled. We went below and checked the oil, cooling system and batteries. Everything looked fine. Finally the instructor called down from the cockpit, asking us who had pulled in the dinghy painter before we got underway. We all looked at each other blankly, each thinking the other guy had checked it. Recalling the previous night’s lecture on taking responsibility, we all hung our heads in shame. Immediately, we started pulling on the painter, first on the end of the line that was attached to the cleat, then on the end attached to the dinghy. Nothing budged. Slowly shaking his head, the instructor said, “Either one of us goes for a swim, or I have to call for a dive boat.” It was a chilly morning, and it felt even colder with the cloudy sky that was not letting any sunshine through. We could feel the instructor’s disappointment and the embarrassment for him if he had to make that call back to the charter base. Being one of the younger guys on the crew, I volunteered to give it a try. There was no dive mask or knife on board—all I had was a pocket knife with a polished wooden handle that my dad had given me. It was a good knife, and it was sharp. I didn’t want to lose it, so I took the lanyard off the handheld compass, tied one end to my wrist and the other to the knife. Then I tied the lazy end of the jib sheet to my waist with a bowline so that the guys on deck could pull me back if I fainted from the cold. After that we took the key out of the ignition, the instructor put it in his pocket, and I jumped into the chilly 55 degree water where instantly I started hyperventilating, taking in only shallow breaths. I treaded water at the surface, trying to acclimatize a little, then took a few breaths and dove down to the prop. As soon as I put my face underwater I could see the line going to the propeller. After another couple of breaths at the surface and a dive to the prop, I got right to it. I first tried to unwrap the line, but it was wound too tightly between the prop and the cutless bearing. Needing another breath of air, I moved back toward the surface only to first have the knife pulled out of my hand and then feel my hand getting pulled back down. Looking over I could now see the lanyard had snagged on the prop. I tugged on it as hard as I could, feeling the line cut into my wrist. Instantly, I panicked and began struggling toward the surface, repeatedly tugging on the lanyard hoping it would break. I stretched my arm out as far as I could, and with my cheek pressed against the hull, I was just able to get my lips to the surface and take a quick breath. Diving down again, I now realized the loop of the lanyard had taken a turn around one of the propeller blades, so I flipped the knife back over the line, which also loosened it enough for me to pull it free. After that I swam to the surface as fast as I could, thrashing around and gasping for air. It was obvious that I was in distress, and my crewmates pulled me onto the swim platform and wrapped me in towels as I shivered uncontrollably. A few minutes later I calmed down enough to tell the others what had happened. The instructor, obviously concerned, said he would call for a diver, but I told him I wanted to give it one more try—I now knew what to do. First, I untied the lanyard from my wrist and the jib sheet from my waist. Then I plunged into the frigid water once more and followed the painter from the dinghy to the propeller with the knife in my hand. After a few rapid strokes of the blade, I could feel it bite into metal. After a couple of more breaths, I was able to unwrap the line from the shaft. Finally, I swam back to the boat and the crew pulled me onto the swim platform, where they had dry towels at the ready and a pot of water boiling for tea. I stripped out of my shorts, dried off quickly, and slipped into my sleeping bag to warm up. We didn’t do a proper walk around the boat, fully checking everything was ready before we got underway. Tying anything to yourself underwater is a bad idea, and so is being near loose lines underwater. We did not have a mask or a sharp knife on board. A wetsuit would have been useful too. We assessed our options of swimming or waiting for a diver, and took the calculated risk of attempting the swim first. We removed the key from the ignition before going near the prop. The crew recognized and treated mild hypothermia. We worked well together as a crew and had a great learning experience. Andre Joniec is a sailor currently landlocked on the Alberta prairies. He loves exploring the waters anywhere along North America’s west coast and takes every opportunity he can get to be on the water.